← My Students’ Blog Goes to Final!!! P-3 students are beating the tambourine and reciting shalawat, whereas P-4 and P-5 students share the role. All the girls and some boys singing the national anthem, Indonesia Raya, while others joined their brothers in the Secondary classroom to play percussion. It’s fun! 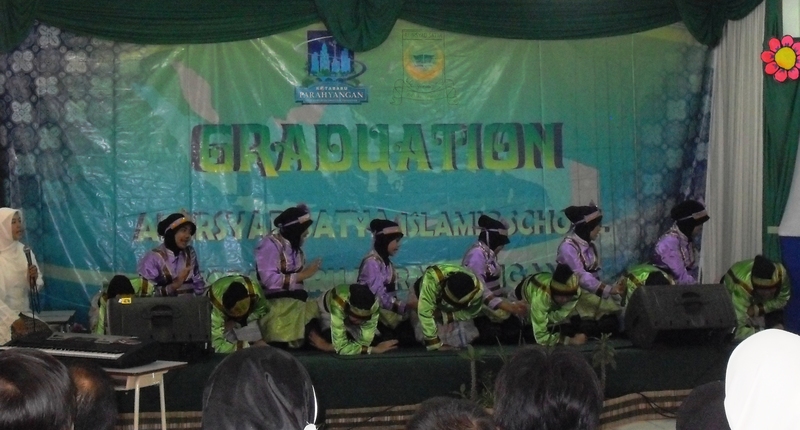 Secondary girls, once again, performed traditional dance, Saman dance beautifully. Saman dance performance by the Secondary girls. Awesome. And where are the students of P-6 and Sec-3? They were certainly “displayed” at the front row, as graduates who are ready to continue their education to the next level, higher ones. There are special procession they have to do. They are proud and happy, although they haven’t got their diploma yet. The future is still very wide spread in front of them, my children. There are 15 graduates of our schools (Primary & Secondary). Most of them are planning to continue their education in Al Irsyad Satya, while three of them have plan to continue to other institutions in Bandung area. There is one boy who pass the selection to a boarding school in Malaysia. Good luck all. No matter where you are studying, hopefully you guys will manage to get the best for yourselves, for your parents’ sake, for your nation and religion too. Insya Allah. Amiin. This entry was posted in School Event and tagged Achievement, Al Irsyad Satya, graduation, my students, performance, Primary, Secondary. Bookmark the permalink.